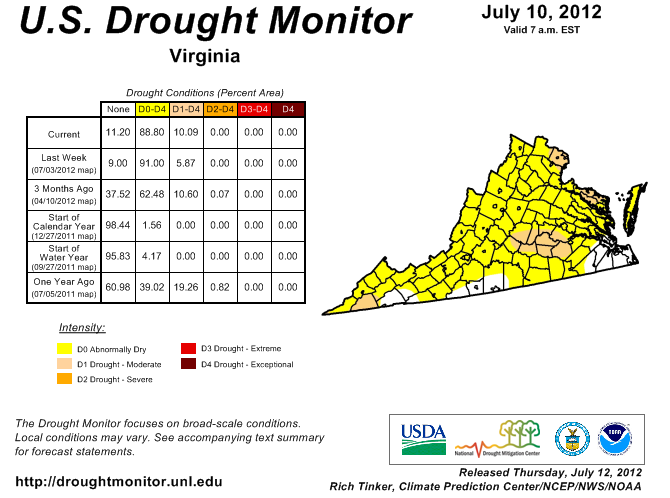 Well looking at the latest drought conditions from US Drought Monitor, Virginia can definitely use the rain. Yesterday, some people saw daily rainfall records set..while others couldn't even squeeze out a drop. Here's an estimated rainfall totals map from the National Weather Service from 8am Saturday to 8am today. The rainfall winners were across central VA/Richmond area and the lower Shenandoah valley-Rockingham County especially. Here are some of the weather-bug station reports..Keep in mind that most of this rainfall fell in under an hour's time...which is remarkable. You can see the kind of flash flooding that this caused from the pictures posted on the facebook page. As for today (Sunday), there is going to be similar slow moving storms. Just like yesterday-some people are going to see a lot, while others hardly see any. I believe the best chance for heavy rainfall may end up being across northern VA today since the warm front has drifted a bit farther north into southern PA. This will set the boundary for storms to be able to fire this afternoon. It's been cloudy across much of nothern VA this morning...but clearing is starting to take place across WV which should move into this area early in the afternoon. Precipitable water values are 1.5-2.0" for nearly all of VA which is the amount of water that would fall if all the moisture in the atmosphere was brought down to the surface. Generally any value over 1.5" is considered pretty high. The more sun that can break out today across northern VA, the better chance they have at seeing severe storms. Yesterday there were several individual slow moving cells that popped up across WV before drifting ENE into VA. Today, it looks like storms may try to form into a more linear line. The RAP (Rapid Refresh Model) has been showing this quite well all morning. It develops a broken line of storms late this evening and pushes it ESE with heavy rain and an isolated severe storm. Another model, the NAM, isn't nearly this aggressive. It only pops up a few isolate storms across northern VA, keeping most of the organized activity farther north across Maryland, PA, NY, and Delaware. How much sunlight breaks out will help determine how much instability convection can feed off of this evening. I'm leaning more towards the RAP model shown above simply because it's already doing a better job picking up on tstorm activity showing up on radar in eastern Kentucky and western WV. This would mean more scattered 1-2" rainfall amounts in a short period of time...similar to what caused flooding yesterday. I think somewhere in northern VA squeezes out a severe thunderstorm somewhere along the way..with gusty winds being the greatest threat.